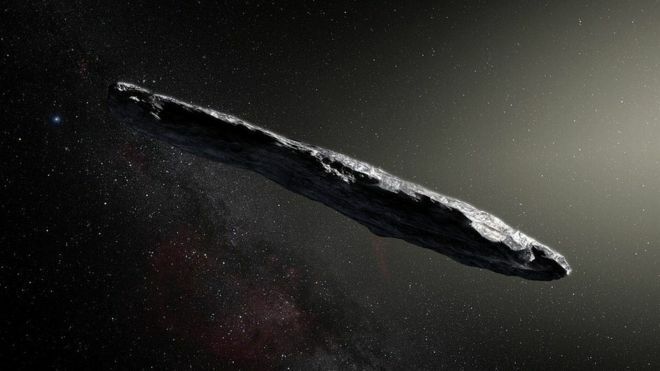 'Oumuamua: First extrasolar object spotted? Skywatchers will be busy for the next couple of weeks. Damn it ! I wish I were that asteroid or comet and go as fast through this Universe and finally find out what's hiding behind. The gravitational pull of our sun adjusted its sharply curved path, flinging it back out of our solar system at a new angle, never to return again. Well, if it was really a comet, then it was a dirty snowball not a rocky asteroid. I suppose our sun is just having a snowball fight with other star systems. Not from another solar system. A chunk of this one, hanging around all these millenia. Bet the ranch. Does Vegas have odds on it? Sixteen years too late, Mr Clarke! Nope. Just on time. Eyes of the Chrons are on you ! I like the meaning of the asteroid's name, 'Oumuamua "a messenger from afar arriving first". I bet stuff like this is responsible for some of the "cigar-shaped," UFOs documented in the 1800s. 'From another solar system" what does that mean? Is it visiting? Is it going home? What solar system, the nearest one?> This is hype to get you to read the article - that's a giant ET cigarshoppe ship, from some solar syatem or other. Maybe. And admit UFO do not exist ? Poor Scully and Mulder. Hard to answer when we only have telescopes and observe them. Call me pedantic but I hate the sloppy use of "solar system." There is, and can only be, one solar system and that is the one with the star called Sol at it's centre (the clue is in the name). The solar system is one example of a stellar system.